Developing countries were prominent in clean energy investment in the first three months of 2018, with China once again accounting for more than 40% of the world total, and eye-catching projects reaching financial close in Morocco, Vietnam, Indonesia and Mexico. 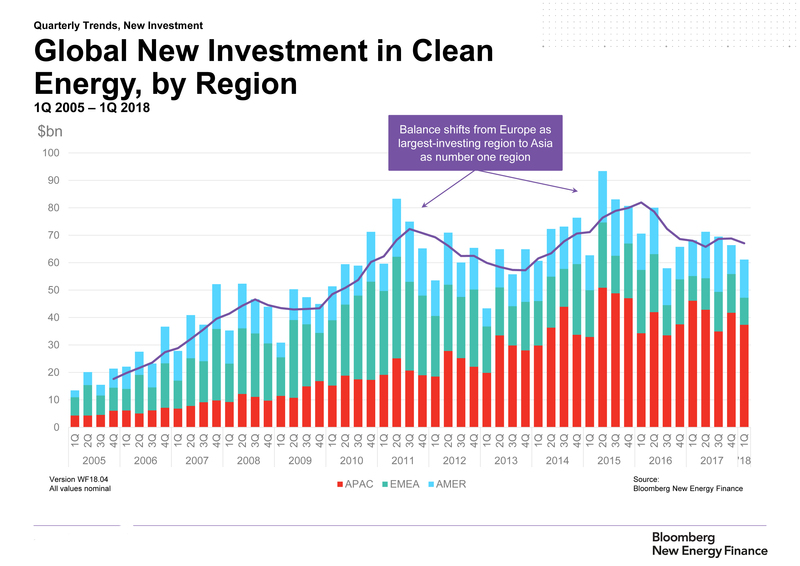 The latest quarterly figures from Bloomberg New Energy Finance (BNEF) show global clean energy investment at US$ 61.1 billion in 1Q 2018, down 10% on the same period a year earlier. 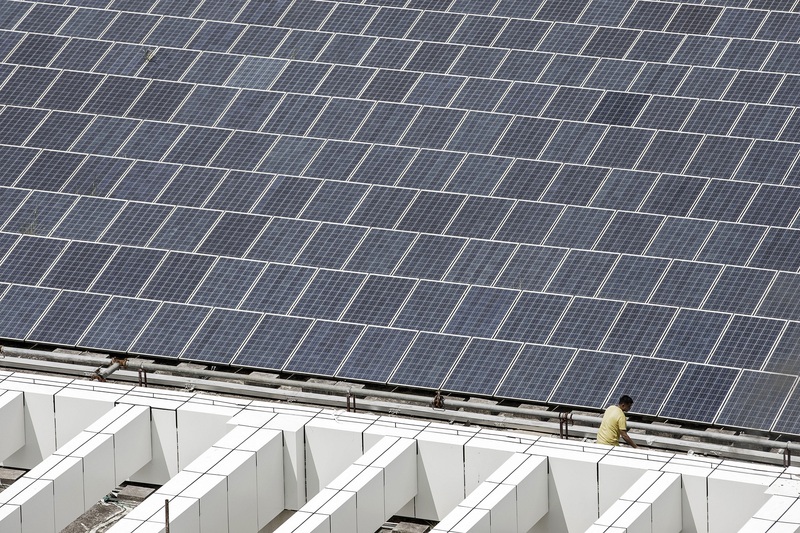 The quarter to the end of March saw solar investment slip 19% to US$ 37.4 billion, affected both by weaker activity in some markets and by lower unit prices for photovoltaic systems. BNEF estimates that benchmark global dollar capital costs per MW for utility-scale solar PV have fallen 7% in the last year. The biggest solar project reaching financial close in the early months of 2018 was the 800 MW Noor Midelt portfolio in Morocco, made up of a mix of PV panels and solar thermal systems with storage. Development banks including KfW of Germany and the European Investment Bank have agreed to fund the complex, which is likely to cost around US$ 2.4 billion. The largest conventional PV installations financed in 1Q were the 709 MW NLC Tangedco portfolio in India, at an estimated US$ 660 million, and the 404 MW Acciona and Tuto Puerto Libertad project in Mexico, at US$ 493 million. Wind investment showed a rise of 10% in the first quarter to US$18.9 billion, while biomass and waste-to-energy declined 29% to US$ 679 million, geothermal rose 39% to US$1 billion and small hydro-electric projects of less than 50 MW attracted US$ 538 million, down 32%. Companies specializing in energy-smart technologies such as smart meters, energy storage and electric vehicles attracted US$ 2 billion, down 8%. Biofuels staged a recovery, with investment up 519% year-on-year to US$ 748 million, thanks to the financing of two U.S. ethanol plants. Looking at the geographical split, China dominated yet again, investing US$26 billion in clean energy in 1Q, although this was down 27% from a hectic first quarter last year. The U.S. saw investment of US$ 10.7 billion, up 16%, while Europe suffered a 17% decline to US$ 6 billion, reflecting an absence of German or U.K. offshore wind deals. India saw investment rise 9% year-on-year to US$ 3.6 billion, while Japanese outlays fell 54% to US$ 1.4 billion. Country highlights included Vietnam, where the financing of wind projects helped its 1Q investment tally to US$ 1.1 billion, a quarterly record, and Mexico, where continuing activity in both solar and wind pushed up its total by 3% year-on-year to US$ 1.3 billion. The financial close on a 91 MW geothermal project in Indonesia helped that country’s tally to US$ 757 million in 1Q 2018. Breaking investment down by type, the first quarter saw a 16% fall in the asset finance of utility-scale renewable energy projects worldwide, to US$ 44.3 billion, but there was a 16% rise to US$ 14.3 billion in the funding of small solar systems of less than 1MW. Public markets investment in specialist clean energy companies plunged 75% to US$ 509 million, the lowest in any quarter for two years. Venture capital and private equity investment was much more impressive, climbing 65% to US$ 2.4 billion, its highest since 3Q 2016. The VC/PE deals in the latest quarter were led by US$ 475 million and US$ 348 million Series B rounds for Chinese electric car companies Beijing CHJ Information Technology and Guangzhou Xiaopeng Motors, and a US$ 224 million private equity expansion capital round for Enerkem, the Canadian biofuel technology developer.